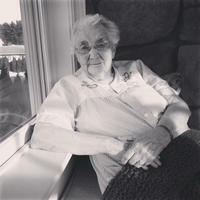 Provide comfort for the family of Gertrude Ramstrom with a meaningful gesture of sympathy. Gertrude Lillian (King) Ramstrom was born in Cleveland, OH on January 27, 1915 to Harry Chester and Ruth Naomi (Pelton) King, the eldest child (and only daughter) of five. The family relocated the town of Haydenville, MA in the early 1920s, where Gertrude grew up. A graduate of Helen E. James High School in Williamsburg, MA, Gertrude went on to earn a teaching degree at what is now Bridgewater State University in 1940. She returned to Haydenville, where she pursued a teaching career in the local elementary school until an early retirement for health reasons. Her long and active retirement was filled with pastimes that included writing poetry, newspaper articles and short stories; arts and crafts, and music. She was a frequent contributor to the Daily Hampshire Gazette in Northampton, MA until she moved to the southern New Hampshire region to be closer to her family. She is predeceased by her parents, Harry and Ruth King; her brothers, Chester, Rowland, Frederick (killed in action in the Second World War) and Roger; and her husband of 49 years, Melvin Teodor Ramstrom. She is survived by a daughter, Beverly Manning, and granddaughter, Lara Skinner, both of Manchester, NH; and a grandson, Jeff Skinner of Stockholm, Sweden. SERVICES: Her Funeral services are pending. To send flowers in memory of Gertrude Ramstrom, please visit our Heartfelt Sympathies Store. Provide comfort for the family of Gertrude Ramstrom by sending flowers. I am so blessed to have met and spend some time with such a sweet lady. I'll miss you Trudy. My sincerest sympathy goes to Lara and the family. She was a lovely lady.